It’s God’s Word that directs our paths, and acts as a compass for our decisions big and small. In his Word, we discover his character, his nature, and his law. For me, the best way to meditate on scripture is to memorize it. When Cara & I went through our church’s internship, we memorized over 50 verses over the summer. 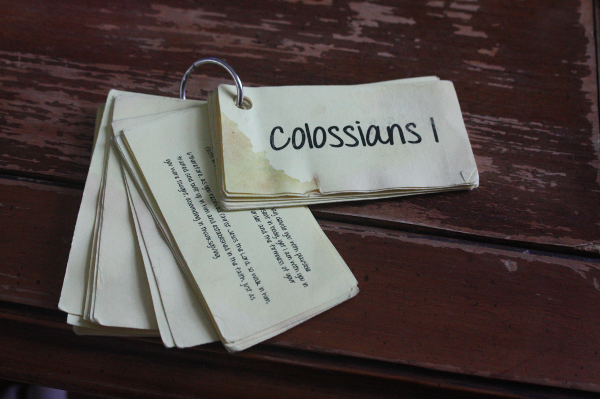 Our main passage was Philippians 2:1-16, and knowing those verses by heart and meditating on them over the years that I’ve had them memorized has helped me to delve deeper into their meaning and Christ’s servant nature than if I just read them occasionally. 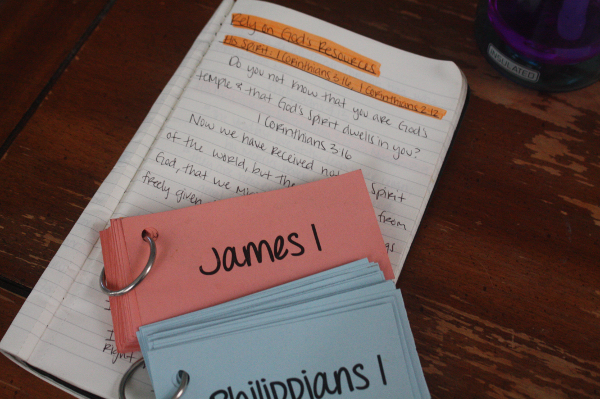 Since the internship, scripture memory has been very important to me. I personally prefer memorizing larger passages of scripture, like whole chapters, to just memorizing one verse. It helps me get a better sense of the context. But you have to start somewhere, so don’t shy away from scripture memory just because you don’t think you can memorize a whole chunk. They key for scripture memory is having a routine. I like to have my verses on flashcards and pull them out in the car while I’m driving. I read a verse while stopped at a light, and then recite it until I get a chance to read another. Then I go back to the first verse and recite all the verses I know several times. When I’m in a good rhythm, I can easily add a verse every day. In the car isn’t the only good place for scripture memory, though. Just think through your day and find some activity that you do daily that you could add scripture memory into. When I was in college, I had a 10 minute walk to class everyday, so I always had my flashcards with me to redeem that time. Now I have a job where I can listen to my headphones, so sometimes I go to BibleGateway and listen to a chapter of scripture on repeat. 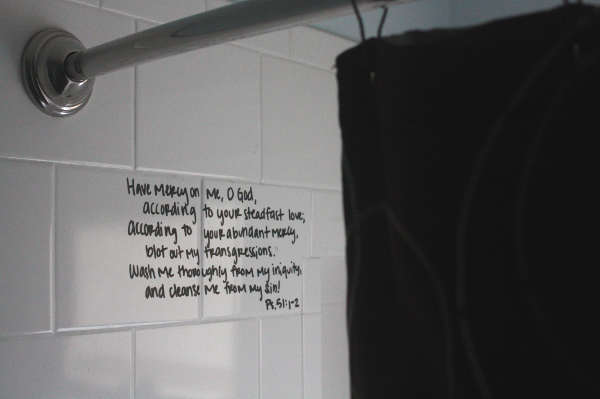 We also have a verse written on the wall of our shower, and sometimes on the marker board in our kitchen. There’s also an amazing scripture memory iPhone app called Fighter Verse. It’s an excellent place to start. It gives you several options for memory verses and memorization styles. And the best part is that you can set it to send you daily reminders, which can help you start a routine of memorization. Honestly, there are a thousand times and places that you can fit scripture memory into your daily routine. Tape a verse to your steering wheel, write one on your milk carton, your fridge, your bathroom mirror, use a verse as your phone lock screen. Display it on something you see or use every day. But I’ve used a lot of other methods, too. I listen to scripture, I use a moleskine journal that I keep in my purse, I have several rings of flashcards, and there are a couple verses in my shower. Don’t feel like you have to stick to one method. Using several will help bring scripture into more facets of your day. 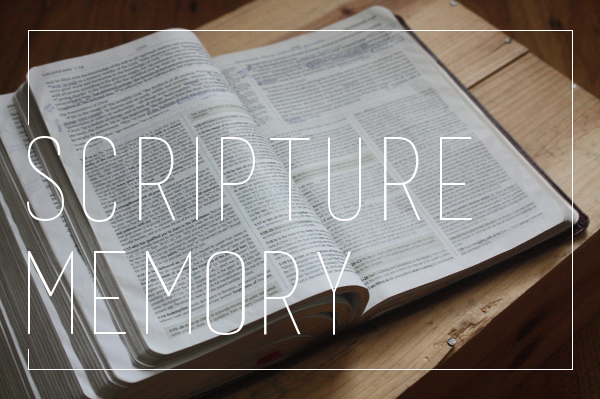 There are few things that have been more beneficial to my Christian walk than scripture memory. I encourage you to start a routine today! Or maybe you already have one going, what works for you? How do you saturate your daily routine with scripture? Read The Bible With Me By The End Of 2017!